Home » Banking » Joint vs. 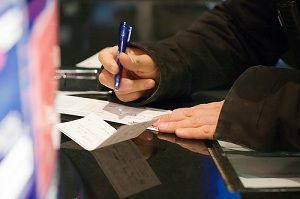 Separate Checking Accounts, Which is Better? Some people swear by joint checking accounts. Others wouldn’t touch it with a 10 foot pole, and prefer to stay with separate checking accounts. Which is the better way to go? That probably depends on personal factors more than anything else. Personal preference is a consideration, but there may be some other factors that are more concrete. There are times, and with some couples, that joint checking is the better choice. Can put the stronger money manager in charge. With many couples, one partner is stronger when it comes to managing money. One spouse may have a history of well-managed finances, and of properly allocating money and paying bills on time. The other may have a bad history on this front. If that’s the case, having a joint account with the stronger money manager in charge will be a benefit to both spouses. It can also be a matter of one spouse simply not wanting to manage the checking account. In reality, managing a checking account is the most important and fundamental function of financial management. One spouse may not want that responsibility. Fewer bank fees. Multiple checking accounts mean multiple monthly fees. By having a joint account you have only a single set of fees each month. It also cuts down on paperwork and management. A single account can be managed much more easily than two separate accounts. It means one bank reconciliation per month rather than two, as well as less paperwork. No more secrets. A joint account is one of the best possible ways of preventing financial secrets. Separate accounts mean that each spouse can handle the money anyway they want. Since they probably don’t review each other’s checking account statements, they have no idea exactly what the other spouse is doing with the money. A joint account removes a major way to keep secrets. Creates a single financial plan. Even following marriage, a couple can have a strategy of two people, two financial plans. Separate checking accounts just don’t do a very good job of helping a couple to merge their finances. A joint checking account will help this come about, and as it does the couple will join in finances in other ways. For example, a couple will have one household budget rather than two, and may work jointly to save for investing and paying off debt. For all of the advantages of joint checking, there are times when separate checking accounts simply work better. Avoids overdrafts. The biggest negative with joint checking is the greater possibility of account overdrafts. You’ll have two people writing checks and running debit transactions out of a single account. That can be an overdraft waiting to happen. With separate accounts, each partner is responsible for his or her own account. For that reason, overdrafts – and the fees they bring – will be less likely to occur. Works as a built in back-up checking account. In the event of identity theft or other problems with one spouse’s checking account, the other spouses account can function as the backup checking account. Sure, the spouse who lost their account can create a new one, but there may be a period of at least a few days where they will have to go without a checking account. In that situation, the other spouses checking account be available to save the day. Can work better with two paychecks. If each spouse has a paycheck, separate checking can work better. When you have a job or business, there are usually expenses attached to it. It could be commuting expenses or buying lunch for a job, or having business expenses in connection with self-employment. In either case, each spouse would need to have a dedicated checking account to enable them to handle both their income and expenses. Unequal credit standings. Separate checking accounts could be a complete necessity if one spouse has superior credit while the other is a poor credit risk. Again we get back to the fact that some people are better at managing money than others. The spouse who is a strong money manager and keeps his or her credit clean, may not want to merge their finances in the form of a checking account. While the stronger spouse is working to keep the couple’s credit and financial standing clean, the other may be driving it down. One of the most destructive ways to do this would be through a joint checking account. Overdraft fees and bounced checks could be routine, compromising the credit standing of the stronger money manager. Which checking account type do you prefer? What are the reasons why you feel that way? I have been separated from my husband of 47 yrs for two years. I have a joint checking acct and my own checking acct also have some cd in my own name. Just found out he owes $17,000 in debt. Am, I responsible for his debt if my name is not on his credit card. I have my own credit card accts with a good fico score. Hi Bryan – That’s another way to do it without getting too much in each others way. Accountability can solve a lot of problems by itself. We all behave better when we know someone else is watching. My wife and I have separate accounts, but we both have access to each others accounts. It’s easier to keep track of what is going on in a account if only one person is working with it. That does seem like a happy medium. It avoids the mechanical problems that joint accounts can bring, but sets the big picture on a parallel path. I’ve always thought that joint vs separate accounts don’t matter, but joint vs seperate finances do. That is, manage the books however you like, but do work together. My husband and i have seperate accounts, but we also have a joint plan on how to accomplish our goals, both individual and joint ones. That has always seemed much more important. Hi Ornella–The suggestion to have a joint account for household expenses is excellent. By a joint emergency account I presume you mean a savings account? It’s depends on the couple. Personally, I don’t see anything wrong with having joint and separate accounts. I suggest couples should have their own separate account and two joint account for the household and a household emergency account. Hi Bill–I would agree, because two people will run more transactons, the likelihood that unauthorized ones can slip through is greater. More transactions creates more cover for that to happen. Hi Wayne–That really is true, neither is inherently better than the other. It’s what works best in your individual situation. Glad to hear it’s worked so well for you and your wife. Hi Manette–Wow that sounds…complicated!!! But if it works for you then you must be doing something right! We have both separate and joint accounts. For some reasons, we decided to open both types of checking accounts. My wife and I have joint accounts. It works best for us. For us, we communicate so well, we’ve never run into the issues you point to. We tell each other when we’ve written checks, so we’ve never had an overdraft situation. This isn’t to say that joint is superior. Just that if you work well together, you probably won’t see the downsides to joint checking. Hi Tushar–Agreed, it’s very peronal. But that’s why we need to have these discussions. There are issues that need to be considered. Finances, especially in marriages, are so personal. Having all funds completely combined might work for some couples and it might not work for others. I think that as long as there is transparency in a relationship when it comes to money, the couple is good. While having joint accounts can be a good idea, I’d issue one word of warning: be sure that both partners review the activities in each account in order to guard against suspicious charges or fraudulent activity. The risk of joint accounts is that, with both partners making purchases, its easier for an unauthorized charge to slip through the cracks, especially if its for a small amount.